The state Land Use Commission set a June 5 hearing yesterday for a petition filed by the Defend Oahu Coalition urging the agency to rescind its 1986 reclassification of 236 acres in Kahuku from agriculture to urban. The coalition's co-chairman, Mark Cunningham, left, waited outside the room. Oahu's controversial Turtle Bay Resort is attracting multiple parties interested in acquiring part of the 850-acre North Shore resort, according to a member of an advisory group commissioned by Gov. Linda Lingle. "Papers were put on the table by potential buyers," said Steve Metter, head of a subcommittee responsible for acquisition options. Meanwhile, a financial consultant hired by the state says that any buyer would need at least some further development, possibly outside of the existing hotel's footprint, in order to recoup money that would be required to maintain the resort. An advisory group commissioned by Gov. Linda Lingle is negotiating with multiple parties interested in purchasing part of the Turtle Bay Resort on Oahu's North Shore. "Papers were put on the table by potential buyers," said Steve Metter, head of a subcommittee responsible for acquisition options. Though the state does not own the property, it has been receiving unsolicited offers, he said. Metter declined to elaborate on his comment at yesterday's meeting of the Turtle Bay Advisory Working Group but said that the prospective buyers are interested in addressing the needs of the community, which has been unwavering in its efforts to keep intact the rural character of the North Shore. However, any long-term buyer would need to develop at least a low-density project in order to recoup the money that would be required to maintain the existing resort, said Samuel Chung, a financial consultant hired by the state to conduct an independent analysis of the Turtle Bay hotel. Chung estimated that a buyer would need to spend between $30 million and $35 million just to maintain the property. "I'm not sure any major hotel chain would be interested in the site without having some developable piece," he said. "For an interested long-term owner to buy the hotel, they would need something to develop or build to offset some of the capital expenses." Chung added, "A low-density project would be tough to develop in the footprint of the existing hotel." The state is considering acquiring the 850-acre property and selling the resort portion to protect the remaining land from future development. Oaktree Capital Management LP, which is facing foreclosure on $283 million in loan repayments, has permits to develop up to 3,500 hotel and condominium units. Oaktree spent $55 million on hotel renovations from 2001 to 2003 in addition to $7.2 million on golf course upgrades, yet the resort had been unprofitable up until 2005, when it recorded marginal gains, Chung said. "The hotel is making a decent amount of money now," he said. "If you don't put additional capital into it, it is at risk to go back to three years ago when it was losing money." A separate subcommittee focused on the resort's long-term viability concluded earlier that limited expansion within the resort's existing footprint might be necessary, though development would hinge on community support. 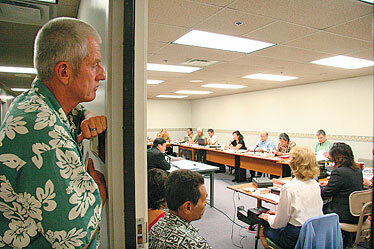 Some of the group members have taken the position that any more development could also put the existing resort at risk if it takes away Turtle Bay's unique open and isolated rural environment. "The hotel itself is at risk unless it is bought very inexpensively, but that's just not what's going to happen," Metter said. "The players got the memo that it would have to be a narrowly defined, modest development if any." If an acquisition were successful, the state would move to change the entitlements to protect the undeveloped land. "The time is now to lock in the undeveloped land and lock them forever," said Ted Liu, head of the state Department of Business, Economic Development and Tourism, who is part of the working group. Meanwhile, the state Land Use Commission set a June 5 hearing yesterday for a petition filed by the Defend Oahu Coalition urging the agency to rescind its 1986 reclassification of 236 acres in Kahuku from agriculture to urban, which cleared the way for the expansion plans.